Apparently we have a limited supply of willpower each day. In New Zealand we also have a limited supply of specialist plant nurseries - many have closed over the last twenty or so years. So there is a shrinking list of plants available to buy. The vagaries of garden fashion are partly to blame but, more importantly, fewer people have the time or interest for gardening. However, a recent development is the increased interest in growing vegetables and fruit. I think this is great for many reasons, and maybe it will be the gateway for more people to discover other horticultural delights. But I need no encouragement - I am very susceptible to the lure of almost any plants! And Hokonui Alpines have a good catalogue, often refreshed with new and intriguing additions. So especially in times of will-depletion I find the catalogue quite irresistible, knowing that they offer plants not available otherwise (and that they are so friendly and helpful and provide such good plants.) I succumbed recently and was delighted to receive a box of plants from them a few days ago. But I need no encouragement - I am very susceptible to the lure of almost any plants! And Hokonui Alpines have a good catalogue, often refreshed with new and intriguing additions. So especially in times of will-depletion I find the catalogue quite irresistable, knowing that they offer plants not available otherwise (and that they are so friendly and helpful and provide such good plants.) I succumbed recently and was delighted to receive a box of plants from them a few days ago. Here is one - not impossible to get from other sources, but a treasure all the same. 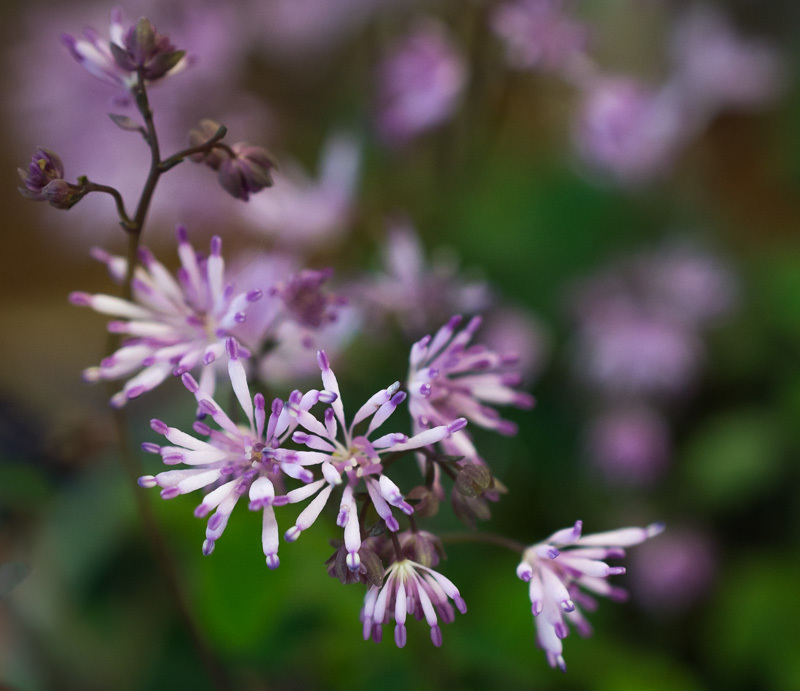 Thalictrum kiusianum, known as Kyushu meadow-rue (it is native to Korea and Kyushu, Japan) or as dwarf meadow-rue. It is a low growing (up to about 15cm or 6 inches high) groundcover from moist woodland alpine areas, conditions I must now try to emulate. It makes a mat of little leaves that look quite like the leaflets of a maidenhair fern. Above the midgreen leaves, tiny starry flowers are clustered on slender stems giving a light airy almost fluffy impression. It looks delicate, but I hope that it will live happily here.